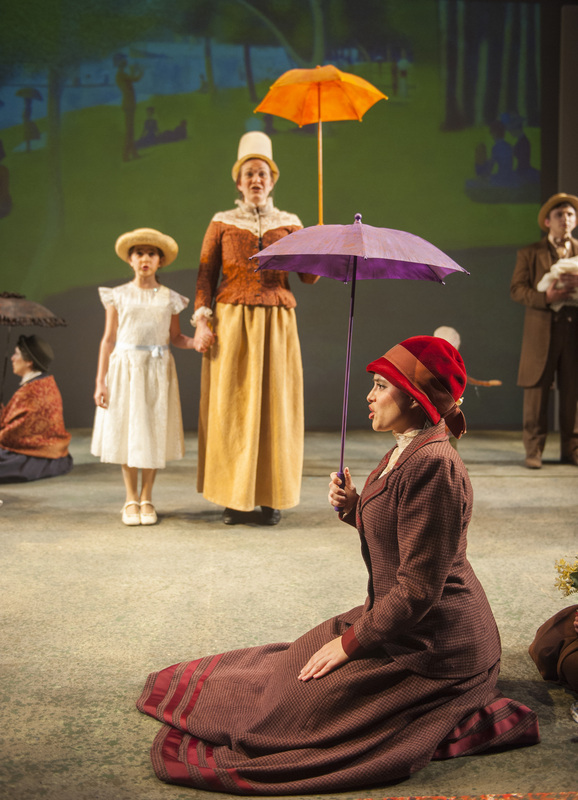 Foothill Music Theatre just opened their production of a rarely done, but arguably the most ethereal show in the Sondheim canon, Sunday in the Park with George – a musical based on the Georges Seurat painting, A Sunday Afternoon on the Island of La Grande Jatte. The painting is surreal, an example of Seurat’s Pointillism technique that was a vivid departure from the approach used by the impressionists of his time. Pointillism is essentially a mosaic of complementary colors that, when viewed at a distance, causes the brain to fuse the colors and register a complex color, such as seeing violet emerge when only blue and red are actually painted. 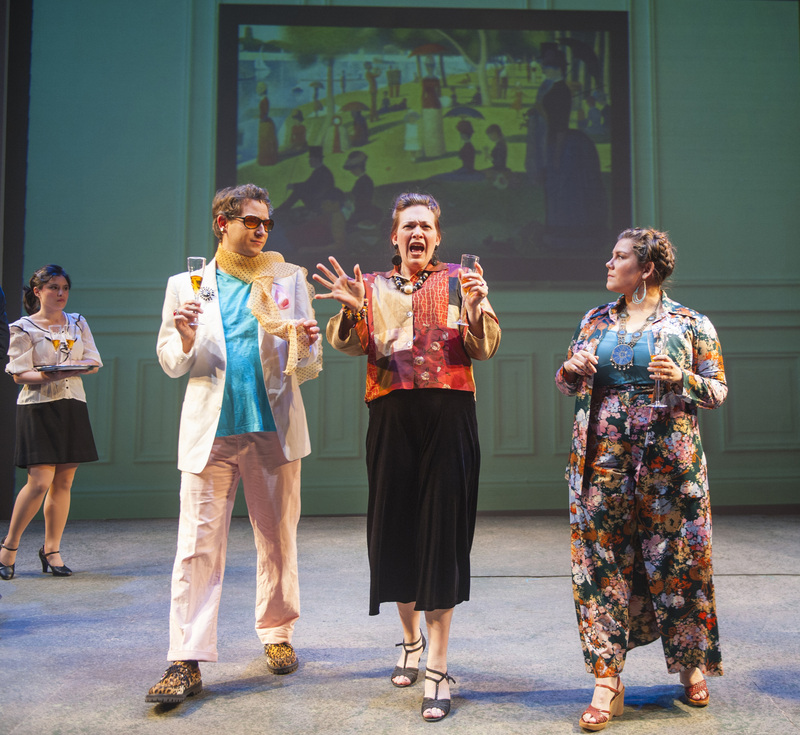 Likewise, this first collaboration between composer and lyricist Stephen Sondheim and playwright and director James Lapine whisks the audience members into a surreal world of color and light worthy of Seurat. The story is a fictional account exploring Seurat’s motivation and character in life, and in his work, which are one and the same in this play. The family relationships depicted in the play are not drawn from Seurat’s real life. Act 1 takes place in the mid-1880s and has two locations – the park along the Seine, and Georges’ studio. Act 2 jumps 100 years to 1984 where George, Georges’ fictional great-grandson (though the real Seurat had no grandson, let alone any great-grandson in real life), is also a struggling artist, but he uses a different medium. The show opens as a blank canvas with Georges (Tyler Bennett/Sergey Khalikulov – note that Bennett performed opening night) at his sketch pad. Soon, a scene forms, a park along the Seine. Georges’ model and mistress, Dot (Katie Nix), is attired in a heavy dress with a high bustle. She stands in the hot sun as Georges sketches her. As time goes on, various passersby enter the scene though Georges isn’t one to engage in frivolous chatter. He’s focused on his sketching, even as the scene turns to fantasy when Dot steps out of her dress and moves provocatively around Georges and the stage, as the two of them sing the title number. Beyond Georges and Dot, 14 additional actors form a featured supporting cast playing characters that appeared in Georges’ famous painting. Each is featured at some point, and each provides color to the painting that Georges is capturing. There are also five pit singers included in the cast, each serving as understudies to various roles. Two very telling numbers in Act 1 include “Finishing the Hat” and “Beautiful”. The first is a solo stream-of-consciousness number where Georges presents his thoughts on life, and on the importance of following his creative path to the exclusion of all else. The second is a duet with the Old Lady (Linda Piccone) where Georges explains all of the things of beauty in the world. He claims that “beautiful” is forever, but “pretty” is fleeting, changing with the times and whims of what is fashionable. In Act 2 the story resumes in the park where Act 1 leaves off in a delightful number called “It’s Hot Up Here.” The cast, sans Georges, is stuck in the painting, and in addition to being musically interesting, the number is insightful and very funny. Once the story jumps forward in time, most of the cast members have a modern day role as well, far removed from their 19th century characters, and it’s interesting to see the contrasts. Sondheim had clearly established his unique style by the time this collaboration emerged, a style that is instantly recognizable in its complexity with rhythmic patter songs filled with crisp, clever lyrics. The cast handles the difficult score and tongue-twisting lyrics rather nicely for the most part although there are just a few moments when some of the quick one-liners don’t come through. Bennett and Nix show off their vocal chops in several gorgeous solos along with some lovely duets that are part lyric ballad and part fugue. “Color and Light” illustrates this wonderfully with an orchestral rhythm that both Bennett and Nix pick up in turn or in rapid-fire musical exchanges. Both have excellent diction, which is critical in Sondheim music, and they tell a compelling story. In a more conversational bent, Bennett has some nice exchanges with Kevin Kirby’s Jules, a more successful artist and caustic friend, while Nix and Caitlin Lawrence Papp’s Yvonne also banter as rivals of a different sort. Piccone is wonderful as Georges’ mother. She is both touching and funny, and plays a very sympathetic character. Her jabs at both Vanessa Alvarez who plays her nurse, and at Bennett are completely in character and may remind some of their slightly eccentric grandmothers. In Act 2, Piccone plays an art critic who is delightfully surly at just the right moment. A few of the actors in some minor roles aren’t quite as polished, but their coarseness isn’t disruptive, and any fleeting missteps are recovered quickly. Milissa Carey’s staging is spot on. This is a show that needs to appear magical as the tableaus appear out of chaos in some sequences, the most striking is the Act 1 finale when the painting emerges. These aren’t forced, but instead they flow organically from the action. The cast becomes the foreground of the painting, with the background projected behind them upstage, and the effect is captivating. Act 2’s “Putting it Together” is artfully scattered with frozen tableaus to punctuate the duality between the external action and George’s thoughts. Bruce McLeod, Michael Rooney, and Erik Scanlon provide the scenic, lighting and video designs for the production. The scenic design is very clean and open, and although the space is tight, the design keeps the character of the original Broadway run. The laser light show early in Act 2 fits nicely and contrasts with the painting. Music director Dolores Duran-Cefalu commands a seven piece orchestra, reduced from the scored twelve parts, to provide a strong counterpoint to the vocalists on stage. One early missed phrase was noticeable on opening night, but overall, the instrumentalists were up to the challenge of this difficult Sondheim score. Andrew Heller provided a solid sound design, though the orchestra/cast balance still needs just a slight bit of tweaking for a few of the full company quick exchanges. While the cast is miked, the amplification is very subtle to allow the actors to focus on their diction rather than projection. FMT has gone through a number of changes in leadership and in accessibility to talent. In the past, the casts were made up of a combination of actors from the Foothill Conservatory program and the community. Regulatory changes required by the state have imposed strict limits on the number of times anyone can enroll in the class that is the show. This has eliminated a number of community regulars who’ve been performing in FMT productions in the past, and it will force greater turnover in the future as more of the community actors become ineligible to participate. In spite of these changes, the company should be proud of the quality of this production. Don’t miss this one. When: Continues through 8 March 2015, Thursdays, Fridays and Saturdays at 8PM, and Sundays at 2PM.